The Study Group has produced a number of publications and drawings which are available for purchase. These are available both to members and to non-members, but one of the benefits of membership is that members can purchase them at a reduced price. 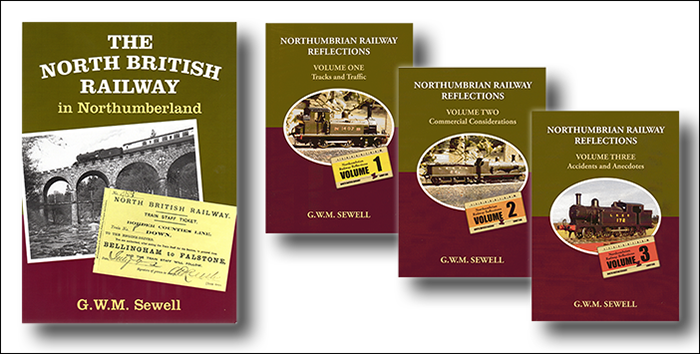 In addition, we can now make available the recently re-published book ‘The North British Railway in Northumberland’ by the late Bill Sewell, and a set of his ’ Northumbrian Railway Reflections’ handbooks in three volumes all as illustrated above. The link below will open a PDF list of our publications, showing the prices for members and non-members. Please contact our Sales Officer for details of how to order.